As I arrive on a bright autumnal morning, staff volunteers and gardeners gather excitedly at the eco-shed before splitting into groups and heading off for the day’s activities around the large, varied and beautifully maintained areas that comprise the Mudlarks’ site. Set up 5 years ago, the project is the brainchild of Vic Hobson, a former teacher with extensive experience working with both adults and children with mental health issues. It came about after she noticed a distinct lack of opportunities for adults with severe learning difficulties to be involved in educational, social and community activities when they had left school at 18. 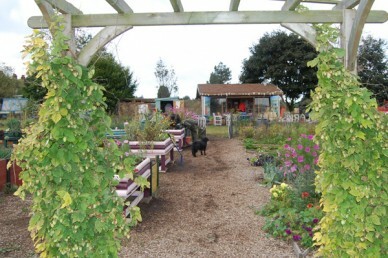 With this in mind and after securing a large area of previously disused allotments from Hertford council, the Mudlarks set about creating what is now a diverse environment comprising communal areas, personalised plots, wildlife areas and buildings. The focal point is the fabulous ‘living’ eco-building (shown above) with its sedum roof that features a wood burning stove, composting toilet and the all important tea making facilities. Activities are varied and specifically tailored to the individual needs of each gardener so they can can choose to do whatever they like, whether that is tending their own personalised plots or helping to maintain the shared areas. 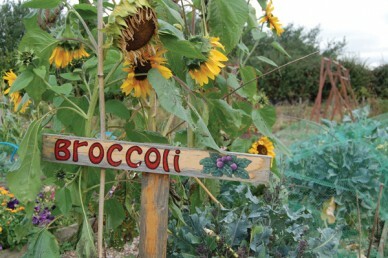 Every aspect of growing produce is covered as well as many other practical activities such as woodworking, building and conservation projects. On the day of my visit there was a full compliment of gardeners, volunteers and staff hard at work building raised beds (pictured above), tidying the greenhouse and creating a new wildlife area. There was a tangible buzz with everyone, staff, volunteers and gardeners all very much at ease in one another’s company – I could see there was an overwhelming sense of community, a common aim, and of achievement. Of course the seasons change and the British weather will often force even for the most avid gardener inside. On these occasions the Mudlarks will be found engaged in fixing, making and other creative activities in the warmth of their clubhouse – there is always something to do here. 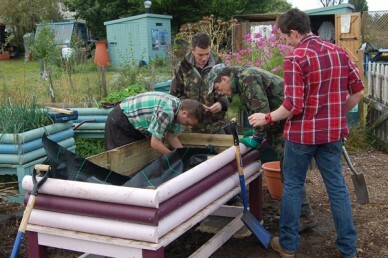 The activity doesn’t stop there either as, when they aren’t at the allotment, Mudlarks staff also work on other projects at local schools for children with severe learning difficulties. 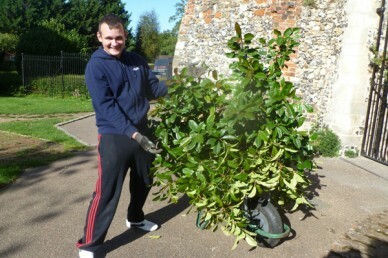 They also run a gardening team that helps maintain many local community areas including those around Hertford Castle (above) and St Leonard’s Church in Bengeo. Of course this all takes money. The project is partly funded by payments received for the gardeners’ placements with hard fought for grants, awards and donations also helping. However, the team also put lots of effort into their own fundraising ideas and will often be found selling produce at local events to help pay for essentials such as ground rents, new tools, equipment and vehicles not to mention the new and exciting projects which Vic and the team are continually developing. 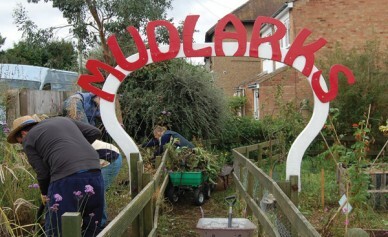 Mudlarks currently runs on Tuesdays, Wednesdays and Fridays all year round so if you know someone who could benefit from its brand of horticultural therapy you can enquire direct or through social services. 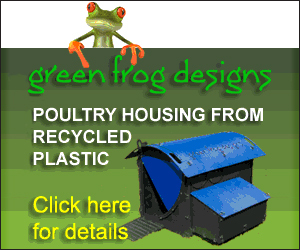 Even if there aren’t places available when you apply there is a waiting list that you can join.